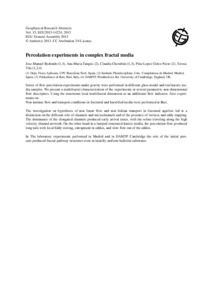 Redondo, J. M.; Tarquis Alfonso, A.; Cherubini, C.; Lopez, P.; Vila, T.
Series of flow percolation experiments under gravity were performed in different glass model and real karstic media samples. We present a multifractal characterization of the experiments in several parametric non-dimensional flow descriptors. Using the maximum local multifractal dimension as an additional flow indicator. Also experiments on Non laminar flow and transport conditions in fractured and karstified media were performed at Bari. The investigation on hypothesis of non linear flow and non fickian transport in fractured aquifers led to a distinction on the different role of channels and microchannels and of the presence of vortices and eddy trapping. The dominance of the elongated channels produced early arrival times, with the solute traveling along the high velocity channel network. On the other hand in a lumped structured karstic media, the percolation flow produced long tails with local Eddy mixing, entrapment in eddies, and slow flow out of the eddies. Redondo, J. [et al.]. Percolation experiments in complex fractal media. A: European Geosciences Union General Assembly. "Geophysical research abstracts, vol. 15". Viena: 2013, p. 14224-14225.